William Blake once wrote these lines on the power of imagination to perceive the world: "The Sun's Light when he unfolds it / Depends on the Organ that beholds it." Felix Gilman told me that Blake's poetic vision figured into the genesis of The Half-Made World, so I feel it apt to begin talking about the sequel, The Rise of Ransom City here at the beginning of this post. Not simply because it's Blake, but more importantly, because it conveys Gilman's approach to this sequel. 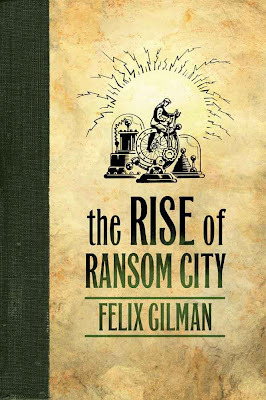 Unlike the first novel, written in third-person limited perspective, chronicling the three-fold adventures of a woman traveling into an unknown frontier, a demonically driven gunslinger, and a human automaton enslaved by a technocracy, The Rise of Ransom City is the first-person memoir of an average man thrust into extraordinary circumstances. This makes for a very different novel from Half-Made World, which involves gunplay, explosions, and chase scenes. That isn't to imply it's a mindless, action-packed B-novel -- far from it. Gilman's steampunk/weird West series takes place in a well-defined secondary world built on the mythos of the American Old West, hyperbolizing the American icons of the Gunfighter and the Steam Engine as enemies in a centuries-old war. At the close of Half-Made World (HMW), our heroes had found something that would turn the tide of this war against both sides, promising hope for a future without the dominance of Gun and the Line. 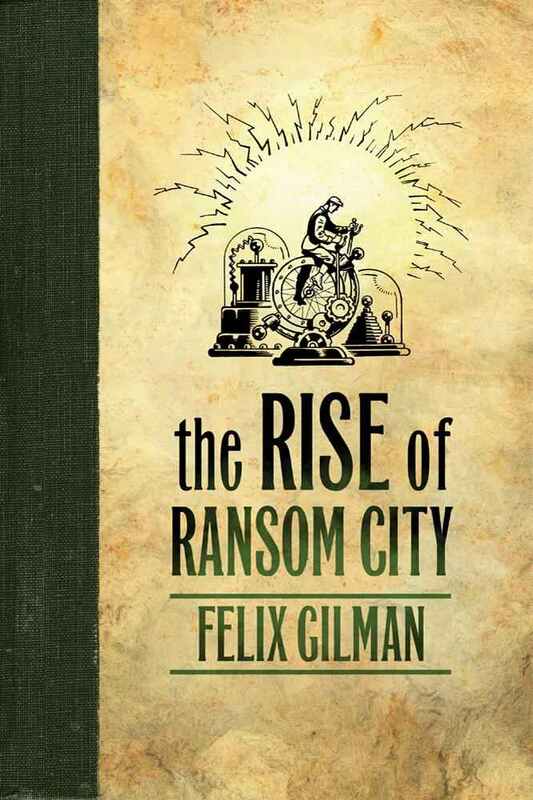 Readers hoping The Rise of Ransom City (RRC) would continue where HMW left off are likely to be disappointed by how long it takes for Gilman to connect the dots between his stories. While the introduction to the story, a brief framing device meant to situate the "found document" of inventor Harry Ransom's exploits, promises that Ransom's account will eventually intersect with the stories of Agent of the Gun John Creedmoor and Dr. Liv Alverhuysen, the reader must first make their peace with this being Harry Ransom's story. Creedmoor and Alverhuysen are just passing through. While I'm aware of readers who found this an unforgivable stylistic choice on Gilman's part, I found the change of perspective a brilliant move. Normally, a fantasy or science fiction author introduces their secondary or alternate world in their first novel, and then spends subsequent books expanding on the geography of that world. In RRC, Gilman avoids having to imagine new narrative spaces by having same or similar fictional locations from HMW be mediated to the reader through a new character's perspective. Harry Ransom sees the "Sun" of Gilman's fictional world through very different eyes than those in HMW. Harry Ransom is not a hero: he is an idealistic inventor who believes that his invention, the Ransom Process, can change the world. This is a drastically different viewpoint from the jaded cynicism of John Creedmore, or the weary determinism of Liv Alverhuysen, or the submissive adherence of the agent of the Line in HMW. Consequently, this is one of the most stylistically literary works of steampunk I've read yet. The framing device is reminiscent of Cervantes' Don Quixote, defending its verisimilitude by purporting to be a document the editor has worked hard to assemble. What you are about to read is not fiction: these are real documents, underscored by the odd editorial footnote. Gilman's style mimics the nineteenth century memoir very well, without losing the twenty-first century reader with anachronistic syntax. The text is often self-reflective, with the unreliable narrator of Harry Ransom openly admitting his unreliability. We know that the great events described occurred - whether they occurred exactly as Ransom has related them is less certain. Nevertheless, the events remain as thrilling as those in HMW, though for different reasons. When an agent of the Gun tracks down Ransom to kill him, we have no hope that the inventor has any chance of surviving. He is not John Creedmoor - Ransom is man of intellect, not action, and Gilman consistently portrays him as such. Even the slightly whimsical voice Gilman affects for his narrator conveys the "everyman in a mad world" theme of the book. Ransom is a very human protagonist, who makes bad choices due to personality flaws. He achieves notoriety almost by accident, though he spends most of the book hoping to build a name for himself. Ransom is a snake-oil salesman whose snake-oil really works: he just doesn't know why it works, and by the end of the book, neither do we. The big mysteries of Gilman's steampunk Old West remain intact. There is a sense of closure, just as there was at the end of HMW, but questions remain. Some people can't stand that sort of ambiguity. I love it. I love that Gilman has increased my view of his secondary world through the eyes of an unreliable narrator. It allowed me to enjoy the story of Harry Ransom, while constantly reminding me that I can't know the truth about this fictional world. At least, not yet. And ultimately, I'm comfortable with that. It feels far more like the world I live in than some "realistic" fiction told by an omniscient third-person narrator who knows everything there is to know about academics who act like James Bond tracking down artifacts to bring down the Church. As an academic, I know the truth - we're more like Harry Ransom, bumbling his way through big events, than we are like Robert Langdon, confidently asserting conspiracy theories about our own half-made world. First comment and we already have a winner! Congrats, Avigayil! Just stopping in to say great blog. I'm new to Steampunk so naturally I was searching around for recommendations and stumbled on your blog. Excited to read more and to lurk in your archives for more books to add to my list.